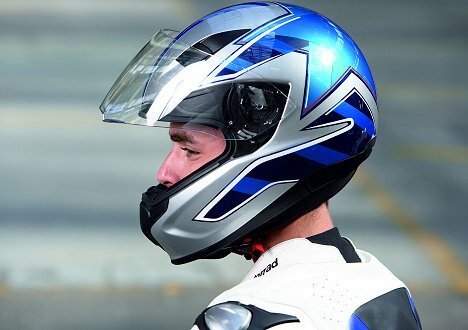 BMW has released its new and ultra-lightweight crash helmet for their sport bike riders. The helmet has been tested and proven to be one of the quietest, lightest and best aerodynamic helmets in the business. BMW tested this by using their own Formula 1 wind tunnel. The new BMW crash test helmet has been manufactured with vents to increase and maximize quality air flow to all over the head. This is of course very important from racers and riders of all kinds. The helmet only weighs 3lbs. 3 POUNDS!!! That’s pretty light. That is thanks to its fiberglass outer body shell. The inner liner is washable, just like most high quality helmets these days. Another important piece of the new BMW helmet is the chin spoiler, better, scratch resistant, visor that’s easier to open and close with your gloves on, interior helmet noise that is reduced to almost nothing, maximum peripheral vision helmet and visor setup (that’s good for me as I have great peripheral vision and use it to my advantage, especially when driving. ), and very importantly, a moisture resistant inner liner that helps to soak up and disperse all of your sweat. That’s so important on hot days, but more importantly for a racer on the track. Look for more BMW Motorcycle topics to make their way on BMW Blog as motorcycles were the first road going machines that BMW made. Back in the day Beamer bikes were some of the most powerful and best racing bikes on the planet. BMW Motorrad has been at the forefront of technology and racing. BMW just recently announced its involvement in the 2009 Superbike World Championship. Thanks for the tip Shrawan!